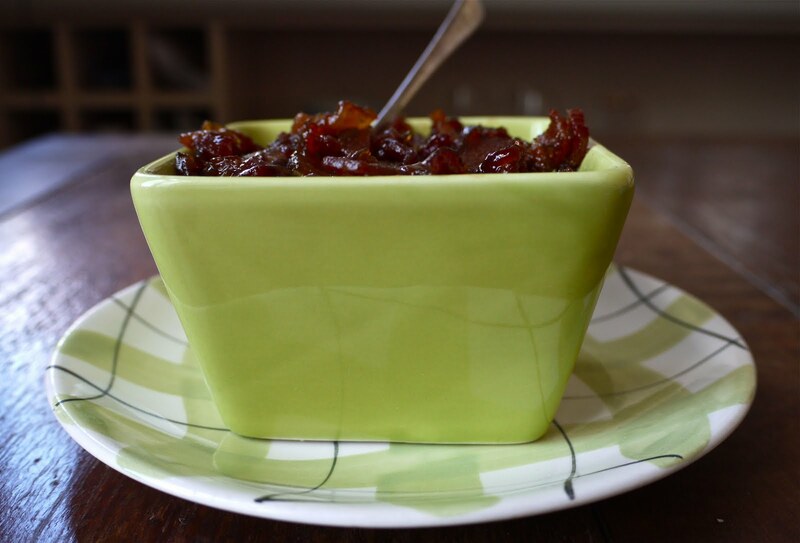 Think of Bacon Jam as a variation on caramelised onions, or chutney – to be stirred into soups or casseroles, or meat sauce made from minced beef. To be spread on bread or crackers. Added to meatballs or meatloaf, inside or on top of a burger patty. Folded through cooked pasta, chopped fried mushrooms, or mustard-sauced, sauteed cabbage, or cooked, quartered waxy potatoes. Mixed with chilli sauce and used to top rice and broccoli. Added to the steak part of a pie’s filling or blanketed with melting cheese in a toasted sandwich or showcased inside a baked potato, freshly busted open and filled with sour cream. We don’t eat a lot of meat so it felt kind of outrageous chopping up 400g of the bacon, but as I’ve demonstrated above, there are so many uses for this stuff that it’s practically…practical. Tim and I buy free-range pork, but I have no way of knowing what’s accessible to you, so use what you’re able to. Given that bacon is the focus of this, I did appreciate the particularly good taste of the Freedom Farm stuff that we used, and also that it didn’t leak any watery liquid during the cooking process. Many thanks to The Family Kitchen, from whom I adapted this recipe. Roughly chop the bacon up, and cook in a large pan. At first it’ll just stew, because of the quantity of bacon, but eventually it’ll start to crisp up a bit. Depending on your bacon, some liquid may have emerged at this point – drain off as much as possible, also drain away as much fat as possible, then transfer the bacon to another bowl for a minute. Gently fry the onions and garlic in that same pan – no need to wash it, and be careful not to let them brown – then add the rest of the ingredients, and return the bacon to the pan, and let cook for around half an hour over a low heat till the liquid has significantly thickened and looks a bit syrupy. I partially covered it during this time, giving it the occasional stir. Remove from the heat, and transfer to an airtight container or jar, and keep in the fridge for a week or two. Makes about 1 1/2 cups full. Instead of golden syrup, you can use maple syrup or honey. Instead of coffee, you can use cola or beer, but so bitterly nutty and dark and rich is coffee against the salty, supersweet flavours at play here, that without having tried any other variants it’s still what I’d urge you to use. Use muscovado sugar if you can get hold of it. It’s so severely intense in flavour compared to regular brown sugar, it kind of goes with everything happening here. So, despite the relatively unusual combinations happening here (unusual depending on how many blogs about candied bacon cupcakes you’ve read, that is) it works and gloriously so. Even while cooking it, the sizzling combination of coffee, dark sugary matter and bacon fat tasted impossibly delicious. Seriously: coffee with all meats from now on, please. Unfortunately I didn’t have a pretty jar to put it in, so an old takeout container had to do. It felt like I hadn’t cooked anything in ages, so today (Sunday) turned into a bit of a frenzied kitchen session. As well as the bacon jam, I also had a go at making homemade Daim bars, as per my promise on Facebook (yeh, I started a Facebook page for this blog in the end, you’re welcome to join or not to join, I won’t narrow my eyes at you if you don’t.) They didn’t quiiite work out. I also made another batch of Nigella’s coconut macaroons, which I’m becoming very attached to, and which will also be featured in my next blog post. Tonight for dinner I’m making a variation on an Ottolenghi recipe, a kind of roasted cauliflower omelet. Unfortunately I blackened the cauliflower florets, but who knew that they still tasted okay, if not great, when burnt? Me, now. Edited to add: Such was the extent to which my homemade Daim bars weren’t quite successful -Tim was reading through this and then turned to me and said “What homemade Daim bars?” and I pointed to where they were situated on the table behind him. And then he said “ohhh thooooose” in a regretful kind of way. Title via: The Laziest Gal In Town (so appropriate to me) choose whether you prefer Marlene Deitrich’s or Nina Simone’s version, for I sure can’t. Tony Award winner Jane Krakowski also has a very cool version on her album of the same name, but you can’t find it on Youtube. Turtle Pizza Cadillacby Parallel Dance Ensemble. One portion of PDE, the spectacular Coco Solid, performed at San Francisco Bath House last night. Tim and I went along, had a very awesome time cutting a caper on the dancefloor and rapping along where we knew the words. We also ran into some nice people from Twitter! As in…someone that I follow, not like Biz Stone. Gil Scott-Heron, I’m New Here, from the album of the same name. I love this, it’s quiet, brooding, and – I don’t like the word, but what can you do – haunting. Next time: the aforementioned coconut macaroons. Right now: Obligatory “OMG it’s July” statement. Where is 2011 going, and why in such a hurry? I love bacon and I like a bit of sweet and salty and yet… I need time to work up to this one! Admission: when I stopped being vegetarian my first carnivorous food was bacon ice-cream. Candied bacon + rum ice-cream. It works. And I have always loved the McD's fries + soft serve combo – even better with a bit of caramel sauce. Terrible yet wonderful! Yep, I'm fairly certain David Lebovitz has done a candied bacon ice cream recipe 😛 But shhhh, I'll totally pretend you came up with the idea first! 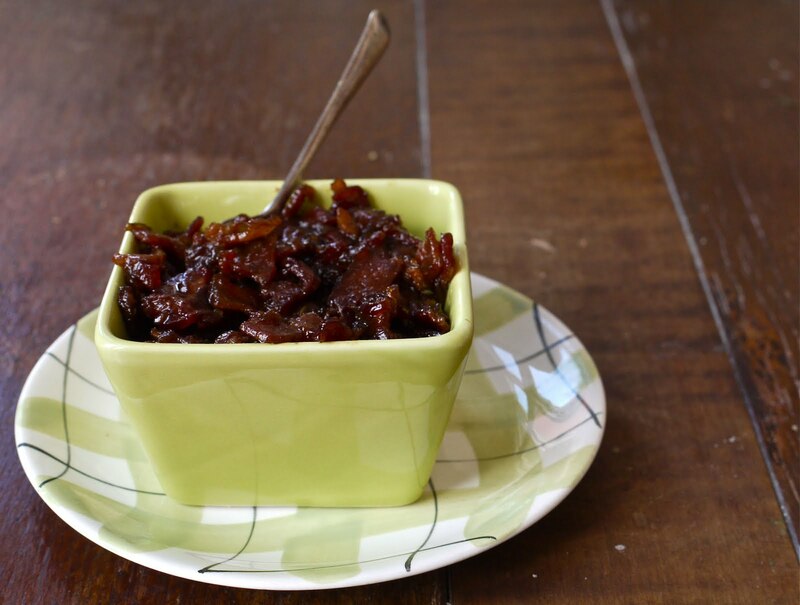 This really does look like caramelised onion jam, but I know my brother would like it far more. I'm also rather excited about the coconut macaroons… I feel like the old-school traditional coconut macaroons have been sorely overlooked in these macaron-crazed times! I especially love your 'omg it's july!' But also, I made an amazing roast cauli salad on friday, so I'm interested to compare! And bacon jam, well. I'm kindof speechless; I love condiments that go with everything and I feel this is totally one of those. Excellent! I wonder if bacon jam would work as a topping for porridge. Hmmm. Wow. 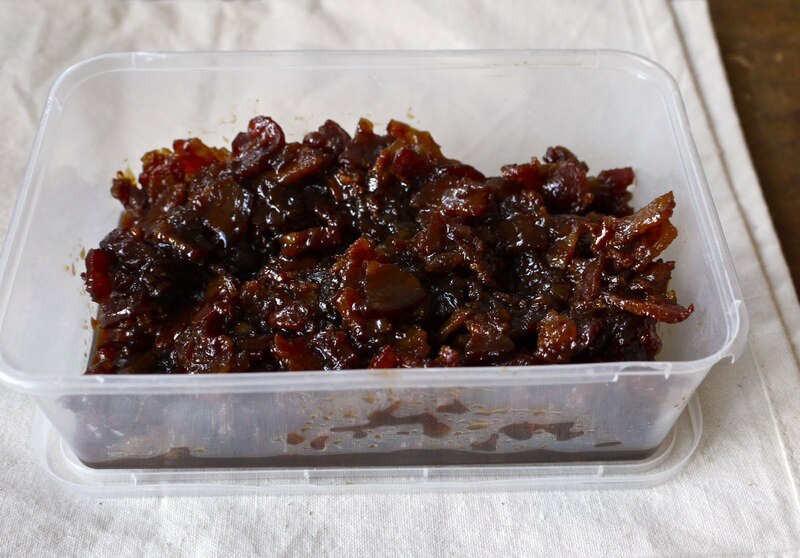 Bacon Jam. Now I've seen everything. I'm not sure that I could do bacon with ice cream… but it would be AMAZING on bread or crackers! Maybe with a good smoked or cheddar cheese? Or in a toastie! What a great idea…. think it would work with duck bacon? lately I've been having strong bacon cravings that strike at about 9:30am and I'm sitting at my desk at work looking over at the Bolton Hotel (who do these yummy baked bacon & egg things) and all I can think is “baaaaacoonnnnn”. Wow! 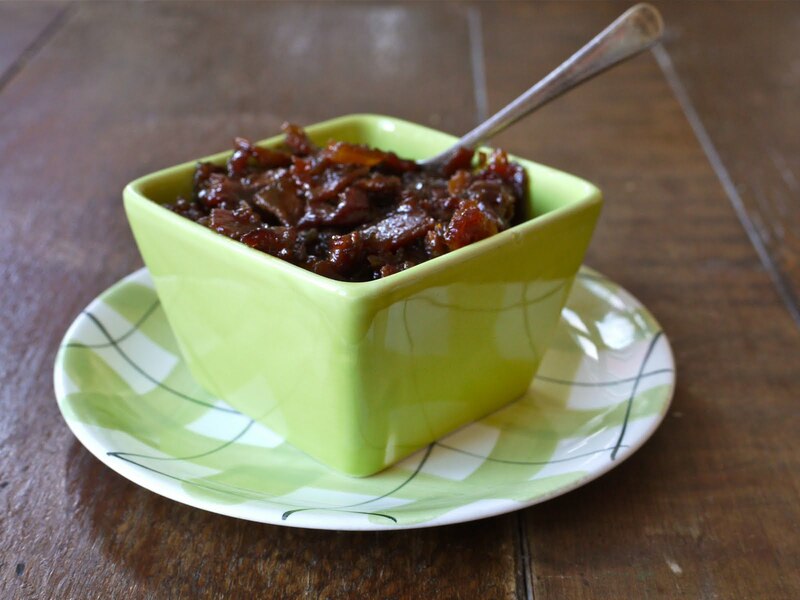 I never got the McDonald's-fries-dipped-in-sundae thing but bacon jam sounds amazing! Oh my goodness. Why has this not been in my life? I'm salivating! 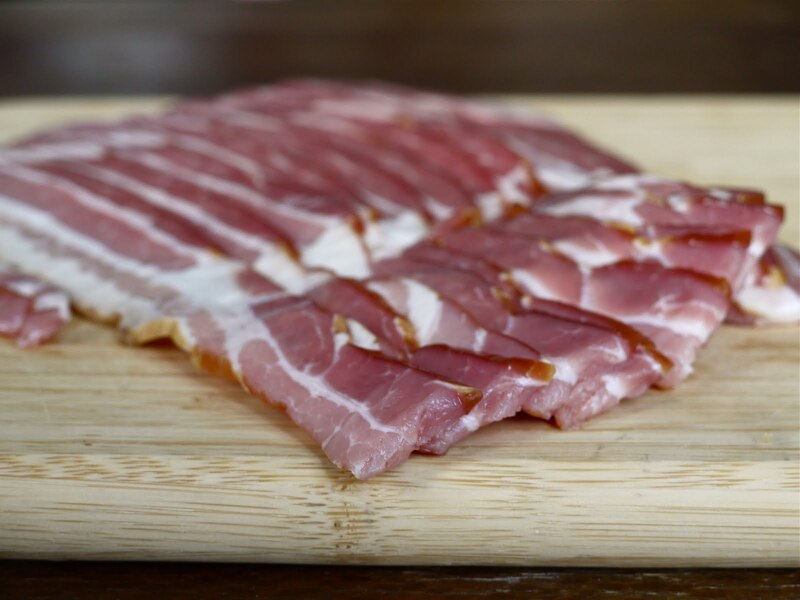 Havoc Farm are selling bags of dry cured bacon pieces — look like off-cuts and loose ends. They taste amazing and they're cheaper than rashers. In the bacon department at Moore Wilson. I think you should make Bacon Martinis to go with this. Although if you want to go full Swanson perhaps a bacon wiskey??? I've made this a couple of times now and every time it's a winner! Last time I scraped up all the un-eaten goo and added some boiling water for a bacony-syrupy-coffee-y beverage of AMAZINGNESS!